Open air is getting crowded. Signals streaming back and forth from smart devices stretch existing fourth-generation wireless networks almost to their limits. As demands on these systems increase, University of Wisconsin–Madison engineers aim to open new frontiers in cutting-edge wireless communications. Their research is part of a National Science Foundation (NSF) initiative announced July 15 to develop the next generation of wireless technologies. 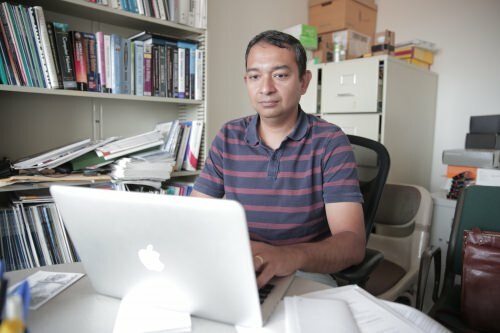 “These four awards given to the researchers at the University of Wisconsin–Madison demonstrate NSF commitments to enabling fundamental wireless research, advancing innovative communication infrastructure, and encouraging collaborations among experts in academia and industry,” says NSF Program Director Thyaga Nandagopal. Across the country, NSF will help establish research platforms and collaborations between academia and industry to investigate, develop and begin implementing key components for the future of communication infrastructure. At UW–Madison, Akbar Sayeed and Xinyu Zhang, both professors of electrical and computer engineering, and Suman Banerjee, a professor of computer science and of electrical and computer engineering, will embark on four pivotal projects. Existing communication networks can barely keep up with the modern world’s insatiable appetite for data. “The need for research advances in wireless communication and mobile systems is stronger than ever before, especially as users continue to expect robust anytime, anywhere access through their personal devices,” says Banerjee. But using millimeter-wave frequencies in the real world is largely beyond the reach of current technology. Given so many disparate avenues of investigation, Sayeed will act as principal investigator for a research coordination network designed to foster collaboration and promote rapid dissemination of results. In addition to bringing together established leaders in the field, the network will make a special effort to include innovative new perspectives from junior faculty members and underrepresented groups. NSF’s support for UW–Madison’s work includes $1.85 million over three years, part of the national initiative’s seven-year, $400 million plan. In addition to being a hub for collaboration, UW–Madison will play host to two wireless testbeds to evaluate the performance of new innovations. One project, WiNEST, led by Banerjee, will establish infrastructure throughout the city of Madison to enable large-scale experiments in real-world settings at currently used frequencies. The other effort, called Multi-beam MIMO, led by Sayeed, will develop a network using a state-of-the-art millimeter-wave prototype technology for simultaneously steering multiple signal beams. That network will enable real-time testing of new communication protocols as well as critical measurements for the challenging problem of steering multiple signal beams at millimeter-wave frequencies. Wisconsin is already a hot spot for advanced wireless research. In 2015, the nation’s first millimeter-wave software radio testbed, WiMi, an NSF-supported project led by Zhang, successfully demonstrated data transmission at 60 gigahertz. More recently, Sayeed’s group successfully demonstrated the first prototype capable of real-time communication of multi-beam data signals at 28 gigahertz, as part of two NSF-funded projects. 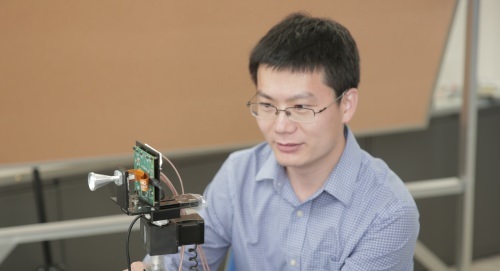 As principal investigator on a networking technology and systems grant under the new initiative, Zhang will apply his expertise to ensuring that next-generation wireless can operate efficiently, fairly and at large scales. Making the future of communication a reality will require extensive collaboration between academia and industry, which can ultimately benefit everyone. These new research projects will also provide unique learning and research opportunities for training wireless engineers and innovators.